For Christmas, Mert and I got Aurora this cute little Fisher Price Shopping cart. Here she is practicing her grocery shopping. She's such a sweetheart. The cart goes nice and slow on the carpet. I'm making good progress on my Nines and Vines. I have 16 out of 56 done. I'll take a picture of my progress on New Years Day to show you. Yesterday was a quiet day here at the Mitchell household. We puttered around, did a bit of boxing day shopping. I bought 2 sweet orchids. I look at them every time I go to the Superstore and have always wanted to pick one up. Today, they're on a boxing week special and I was looking for a nice little gift for a friend who is turning 50 this week. 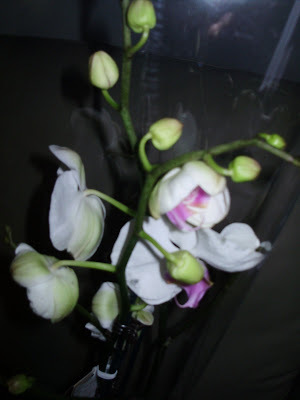 After thinking, and thinking of a nice little gift, Mert suggested Why not get her an orchid. He was exactly right. I know I would love to have received one as a gift, so off we went. I bought one for me and one for her. 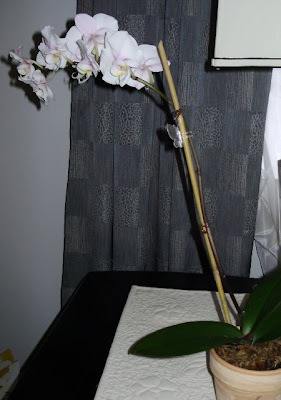 The first orchid is mine. It's white with a hit of violet. 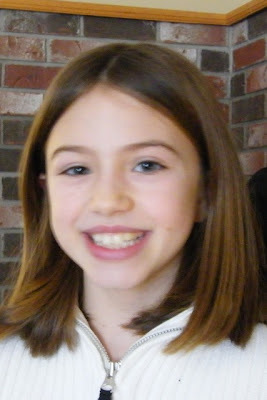 The second picture is of hers. It has a deeper hint of purple in the centers. It still has the cellophane on it so it's hard to get a nice picture like that, but this shows you how pretty the colors are. Late yesterday afternoon, I ventured into my sewing room and organized a bit. I set up my new Ott light that my sister gave me and sat down to sew a bit to try out the light. It's nice. It does give a great light that shows the colors. I sewed for half an hour on my St. Dunstan's quilt. I'm ready to roll on it now. I'm on a deadline. This Nines and Vines has to be finished by January 20th. I have no doubt that I'll have the 56 inner blocks done by the end of this week. I'm afraid of the borders. I'm not that quick with the applique, and my applique has to meet the inspection of these quilters. It's Saturday. Everyone is gone. Now what? I'm sifting through Christmas pictures from the digital. I thought these pictures were cute. 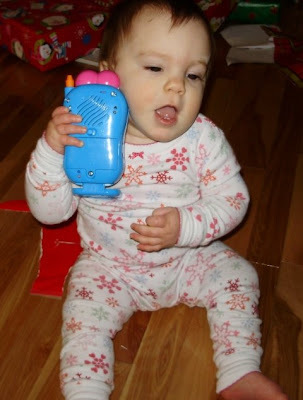 Aurora got a phone for Christmas from Santa. She knew exactly what to do with it... Here she is talking to Elmo. I thought this picture of Jessica walking with Aurora is cute. It's hard to tell who is who when they're wearing the same PJs. On Christmas evening, with new PJ's on, everyone settled down for the evening. We watched a movie that one of the kids got for Christmas. 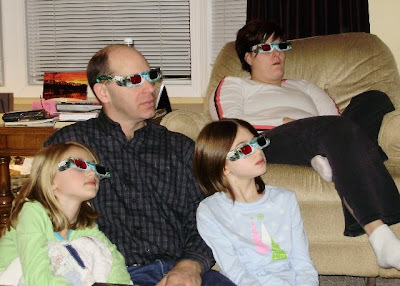 It's a 3d movie and came with 4 pairs of 3d glasses. Here is the gang watching Journey to the Center of the Earth. Carrie, Mert and I watched it without the glasses and it was funny to watch everyone react in unison as scary fish, flying yoyo's and flocks of birds seems so real as they leaped out of the TV. Might be time to plan a sleep over for the triplets. Merry Christmas everyone. We've had an amazing Christmas with a house full of activity. 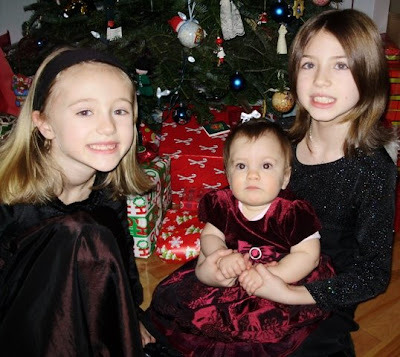 Here is a picture of Emily, Aurora and Jessica just before all of us left for church on Christmas Eve. We met up with Michele and Wade and the triplets. The church was packed when we got there, so luckily, the front pew was open, so I got to sit up front all by myself with all the kids. We love getting a front row seat, for all the manger and choir activity. Also, in the front seat, I get to sing as loud as I want and not one of the kids "shushes" me. They sing loud right along with me. 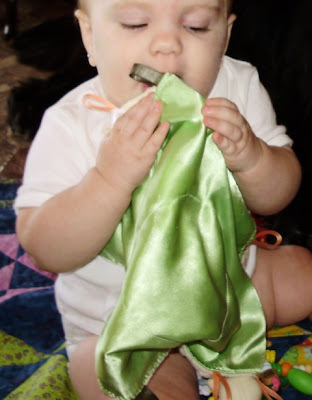 Then on Christmas morning, we spent over an hour opening gifts and ohhing and ahhing over all the gifts. Three families get a lot of gifts! 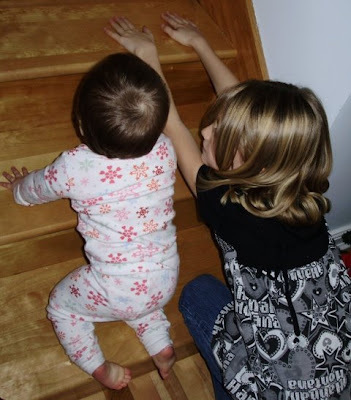 Here is Emily teaching Aurora the finer art of climbing stairs. As you can see, Aurora is a quick learner. She has no stairs at home, so this was fun for her, but scary for Mom. 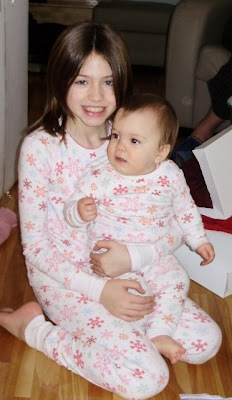 Jessica and Aurora are sporting their nice matching PJ's. It's a good thing Jessica has long hair, it's hard to tell them apart. Aurora totally loved all her presents. 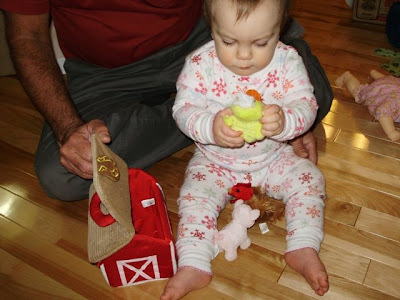 Especially the fuzzy farm with noisy animals that Auntie Donna gave her. 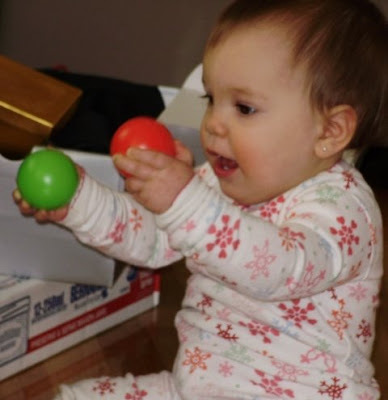 Here she's playing with the balls that came with the pelican toy that she got. Have you ever heard of signing for baby. I first heard of it when I hosted a quilt teacher last year. She told me that she signed with her baby half a dozen words. She couldn't talk enough of the benefits of communicating, just that much further with her baby. Well, it just so happens that Michelle, my sister's daughter, and Aurora's Godmother, bought a "Teach your baby to sign" kit last summer. So Patience has been teaching A. the first sign is "more". The sign is where you clap/tap your fingertips together in front of you. Patience has been practicing with A for a couple of months.... and this week, A has been doing more at least 4 or 5 times a day. We're not sure what she wants more of but it's very recognizable. She's also sending kisses and knows how to "ta ta". Try to get a picture of any of these things.... it's impossible, but we're trying. Today we had our Friday Girls coffee break and Christmas Gift exchange. This year, I hosted the coffee break and got up early to make muffins and cinnamon rolls. The Friday gals arrived around 10 and we had a great chat and show and tell and ohh's and ahhs over baby Aurora who joined us for her snack break. Near the end of our coffee break, we did our gift exchange. Here is my beautiful little gift I received. A sweet little snowman. 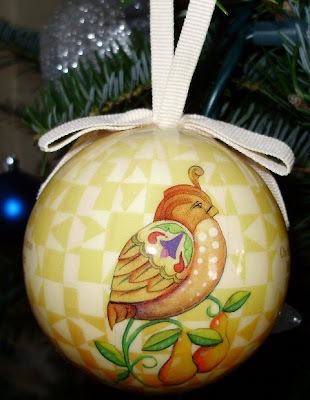 He came from Gail Hooper who rescued him from the Royal Doulton store (I love that store). This little guy fits perfectly on my tree and he looks right at home. It's nice to have decorations that have a little story to tell about where you got it. Thanks Gail and Merry Christmas to all you Friday Girls. It's great having you all as friends and quilting buddies. 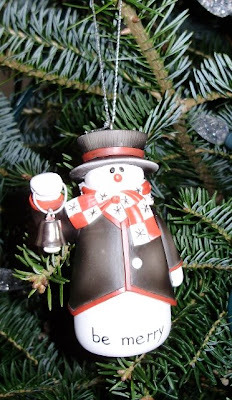 I'm not sure how many days before Christmas now, but it was my intention, for the 12 days before Christmas to show you these really nice Jim Shore Christmas decorations that my sister picked up for me last year. There are 14 in the set. Over the past couple of years, I've really taken to the 12 days of Christmas theme. I bought some fabric last year after Christmas, intending to make something with it... I also bought embroidery designs, with the intent to make something with them... But I've missed on both counts... Oh, well, busy is good, right?! I guess I need to do my 12 days of Christmas stuff this summer, then they'll be all ready for next Christmas. For now, here are a couple of my new set of Jim Shore balls... I really love my new decorations this year. It's been a fun week watching all the celebrations around my sister's 50th birthday. There was so much going on, she has to break it up into several blogs. I'm not sure we'll ever hear about it all. I loved her Peas cake..
Changing the subject, I noticed a few comments on my Aurora Sock that were not from my usual commenters. I looked at my stats and my hits were way up... mostly on my Aurora Sock page. Sure enough, Vicky over at Field Trips in Fibre had listed my Aurora Christmas sock on her Field Trip page. I always love that page, cause she finds very interesting quilting, sewing projects and tutorials. Remember when you took field trips in school, you would always see something different and very interesting. This is the same thing, except, you don't leave your desk, and you get many interesting things all in a very short period of time. Anyway, all these hits got me looking at stats on my blog pages. The blog page counter has been collecting data since July 08 and by far, the most hits I get are from my Pippa Moore - Art deco page. Mostly from people googling searches for Art Deco Quilts. A page that ranks a close second in hits, especially now with Christmas right around the corner, is the Luggage tag tutorial that Linda Hubbard and I developed. We originally did these for the New Brunswick Quilters' Guilds to make as a donation to the Quilt Canada goodie bags. I made about 20 of these myself a few weeks ago, and everyone on my list gets at least one luggage tag presented on their gifts. My little sister turns 50 today. She is a kind, well loved, organized and fun person and I knew, from the size of her circle of friends, that she's in for a doozy of a celebration. You'll have to go to her blog (locate her shortcut in my sidebar) to read all about her surprize 50th birthday celebrations - which came the day before her real birthday. Don't forget to leave her a birthday message, even if you don't know her. Let's try to break her "comment" record! I can't believe I have a 50 year old little sister!!! See my new craft table. 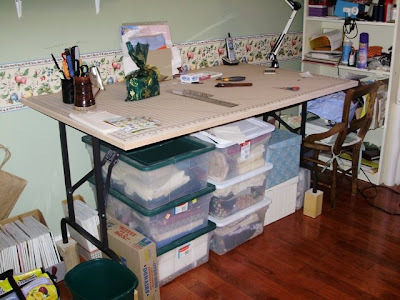 I've had a cutting/craft table for a number of years now. It was the kind with the wings that swing out. The problem with that table, is that there was no usable storage space under the table. My new table uses a simple tabletop with simple legs. This leaves lots of room under for storage. I love how much I've been able to clean up and get my sewing room back into order. At the far side of my table, I have a chair that my surger sits on... ready to be picked up and put on the corner of my table. I prefer a stool, but I'll find something that will suit that space perfectly. 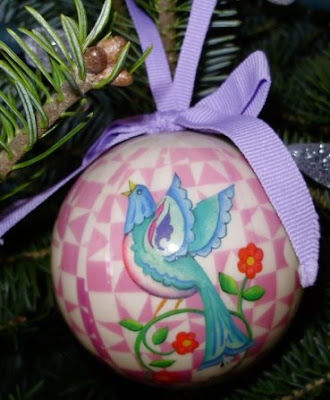 After attending a great kids Christmas concert this week, shopping for gifts, trimming the tree and making gingerbread cookies, I can definitely say "It's beginning to feel a lot like Christmas"! Grace, Caitlin and Mitchell, trimming our tree. Caitlin, hard at work. 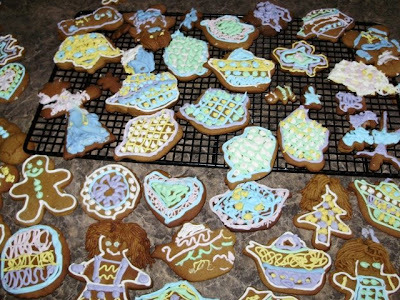 She made lots of teapot gingerbread. 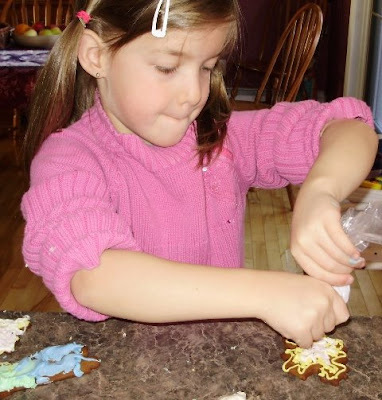 Grace is decorating a cute ballerina gingerbread. 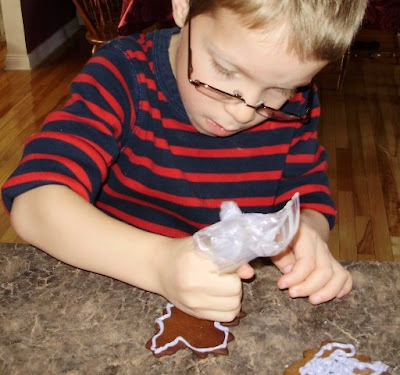 Mitchell is making a Maple Leaf gingerbread cause he plays Hockey for the TimBit Maple Leafs. I think this cookie is for his hockey buddy, Parker. See, what we got for all our hard work. Yummy. Some will hang on the tree, and some will get eaten. Well, I finished Aurora's Crazy Quilted Christmas stocking this week... just in time to take to our quilters luncheon earlier this week. It got many oohhs and ahhhs.... It even inspired one woman to go on a mission to find 9 other women to form a class... just so she could take the class. (That's exactly what I did) I loved doing/learning this project and I want to thank my CQ teacher, Linda Hubbard, and all those CQers out there in blogland who inspired some very nice lines of stitching. For you CQers, this is a large picture, you should be able to click on it and see the detail. Take note of my spider, it was inspired by LouAnne Sassone who did an article for CQonline. I love him. He's right above the angel's head. 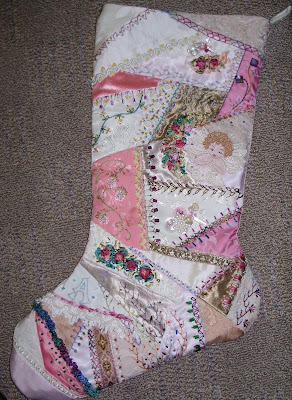 I'm looking forward to starting the handwork on my next 2 stockings as my snowbird 2009 handwork project. We just put the tree up today and it will be decorated tomorrow with the help of 3 little elves aka - the triplets. On Sunday morning after waffles, we'll make gingerbread ornaments, some to decorate my tree, and some to take home with them. We are all looking forward to that. I was so excited yesterday when early in the morning, I received an email from the sailor that was rescued on our cruise 2 weeks ago. It's so nice that he is alive. On the ship, they told us he was doing good, then we didn't hear anything after that. He was dropped off to the Panama Hospital - end of story. Well upon my return from being down south, I posted the video of the rescue on my blog and Youtube. He saw it and sent me the full story. It was a harrowing few days for the guy, but he's doing well. Here is the email he sent me. 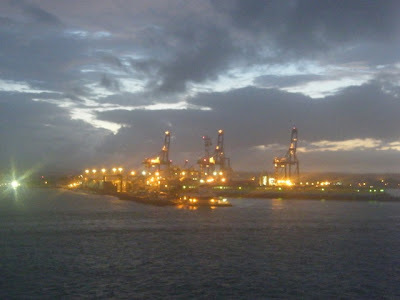 Set sail in late afternoon, and we quickly left Cartagena behind. The sea was calm and we left the bay towards the north of the Caribbean Sea in the direction of Jamaica. Woke up in the morning feeling badly. The sea had deteriorated too much and was stung with contrary winds of 20 knots and waves of 5 '. Our sailboat Illusions, with its 33 feet and built for blue water crossings, due to the strong waves was very slow at only 3.6 kts. Sick, I went out to the deck and threw up for the first time. 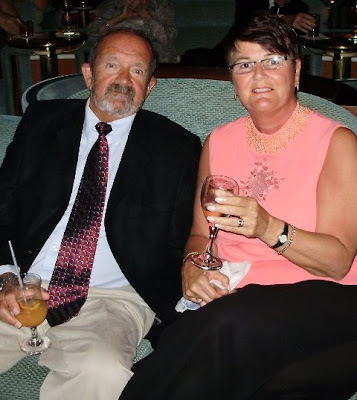 Both, I and Jaime, my friend and sailing companion of 15 years, have been very surprised with what we thought to be just a "sea-sickness" because I had never been sick on a cruise before, over seas worse than what we had there. I didn’t mind much; because once the nausea passed I believed it had been an isolated fact. Few hours later, the nausea came back and I started throwing up frequently. Throughout the day, only ate a green apple that came back minutes later... Woke up in the middle of the night with unbearable nausea, without being able to raise or contain, I vomited profusely. Turning on the lights, I saw me drenched by a huge amount of blood. My hell began. The next day was a torture. The sea worsened by the minute, already with waves of 10 'that swept the deck at any moment and forced us to move more and more slowly, elongating a journey that we wanted to finish quickly. I could not get down and I was lying on the bottom of the deck, where the wind on my face relieved the endless nausea. The vomiting of pure blood remained in a macabre cadence every 3 hours and at the end of the day we reached the conclusion that our signs of distress were not being received by anyone. Then decided to trigger the short-wave radio and started to send a periodic "Mayday" call. My condition worsened a lot. The internal bleeding was now in my bowels and I was feeling very weak. Without eating and drinking for days, my body began to surrender. Lying at the bottom of the deck, I didn’t talk, or rise for anything, nor for basic needs. From time to time big waves washed the deck and my dirty body covered with a piece of canvas and stuck to a lifeguard, not feeling cold or heat as if half anesthetized and unrelated to reality. Felt no fear, nor despair, but knew that the situation has worsened and that I would not stand much longer. In the middle of the night of the fourth day finally a contact! The Navy of Colombia, who was making maneuvers in the Caribbean Sea, heard our cry for help. Sometime later, new contact. It was the Coral Princess. They had been informed by the Colombian Navy and the rescue was on its way, arriving in a couple of hours. The vessel had all the resources for the rescue and salvage. I had no strength to get up and see, but the Coral Princess emerged as a wonderful vision on the horizon, as my two companions told me. Came slowly and then stop some 500 meters away, with a rescue boat with three crew members quickly getting out of his side. It began then another stage of my torment ... The sea was rough and high, with huge waves that did not allow the approach of the boat. In two of the many attempts there were violent clashes with our sailboat, endangering the safety of both boats and leaving considerable damage in the structure of Illusions. I felt that this approach would be impossible and was even wondering for how long the attempt would remain. The radio worked non-stop between the ship's captain, the rescue boat and Illusions, but could do little because the sea conditions were very bad indeed. So, I think I got the worst moment of all this adventure: I clearly heard the cruise captain saying that they could not continue and that another kind of rescue should be organized by the Colombian Navy. They would retrieve the rescue boat and go! At that moment I saw my only chance threatened and decided: I would throw myself into the sea and try to swim to the rescue boat! Unsuccessfully my two companions tried to dissuade me, because the sea was very bad and I was very weak. Sharks, weakness, rough sea, nothing would hold me at that time. I flagged to the rescue boat indicating that I would jump and, after also trying to say that it was not prudent, they positioned to receive me. My friend changed my life jacket with one that automatically inflates when touching the water and I was tied to a long rope. I said goodbye to my fellows and dove! The "automatic" life-jacket didn’t inflated and I sank like a stone! I started swimming with all forces that I still had, and with difficulty but luck, get close to the boat from where they throw me a buoy tied to a rope. The crew pull me quickly and with some difficulty dragged me on board. I was saved! They hoisted by the side of the ship, under the applauses and flashes of hundreds of passengers watching the whole operation from the deck. I was quickly transported to the ICU, where Dr. Colin Cameron and his team immediately began my medical care with serum, blood transfusions, medications, etc... The dry and hot bed of the ICU, my stomach controlled by drugs and a firm environment opposed to the continuous balance of Illusions, represented paradise! I also got a CQ template kit that I had purchased before going on vacation too. I can't wait to use it. It helps evenly space marks for crazy quilting. Watch my blog later today for exciting news from the rescued sailor. This past weekend after we arrived home from our trip, we had some special visitors. Jessica, Emily came for a visit from Moncton and Aurora came for a visit from Saint John. 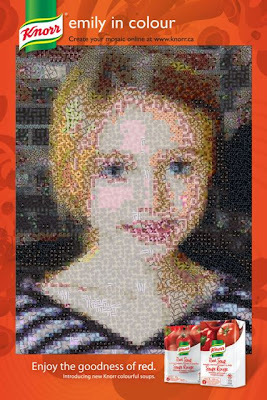 While Jessica and Emily were here, we did a fun computer craft, compliments of knorr.ca. 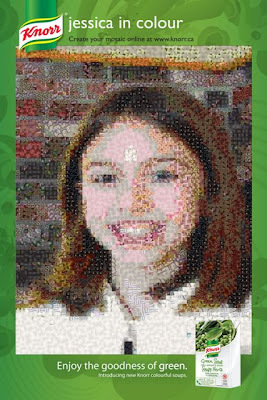 Upload a picture and it does a mosiac picture made of fruits or vegetables. Try it, it's cute. We took the images to the Jean Coutu drugstore and had them printed at the in-store photo machine. It's a fun craft. The first picture above is of Emily, and the second is of Jessica. 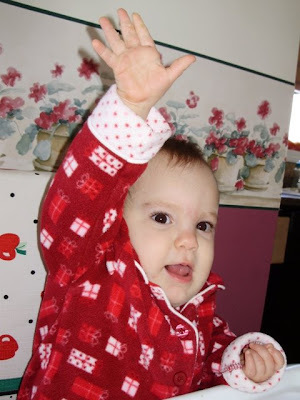 Baby Aurora waves hi now. And her new love of blueberries results in the unexpected. I'll let you use your imagination as to what it is. The triplets come for a sleep over this coming Saturday night. 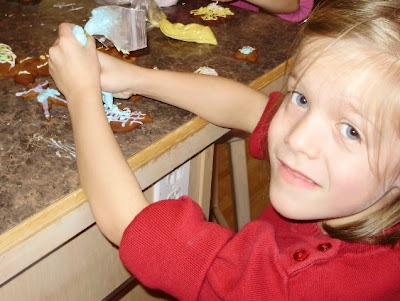 We plan on making a book on Saturday evening and then making and decorating gingerbread men on Sunday morning. I can't wait. 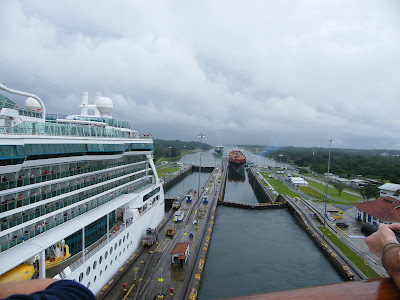 Yesterday I told you about our great day on the Panama Canal. That was our 25th Anniversary celebration day. After such a great day, we were so pooped out from that day, that we only had our 25th Anniversary supper a few days later. We decided to make it special, and to have supper in the Bayu Cafe, a premium restaurant on the Coral Princess. The food was a notch up from the usual dining room and it was well worth the $15.00 cover charge. We started out in the lounge with drinks beforehand. We tee hee'd and talked about how fun this trip had been and how fun it would be if the kids were here. Then we went to the cafe for our 7pm reservation. This cafe is a Louisiana style restaurant that specialized in steak.. Our mouths were watering just from reading the menu. It was fantastic. We couldn't decide on an appetizer so we each ordered a sampler. 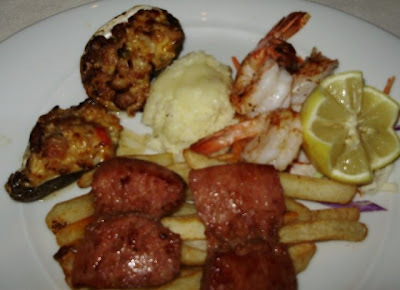 It included stuffed oysters on the shell, shrimp, grits, fries, and spicy andue sausage. We each got a plate of this. No need to say, we didn't eat the fries or grits. The best thing on here was the stuffed oysters. They were so different and both thought they were the best. That is saying something because the shrimp were a very close second. Then after settling down and drinking a glass of wine, we had our main entree. 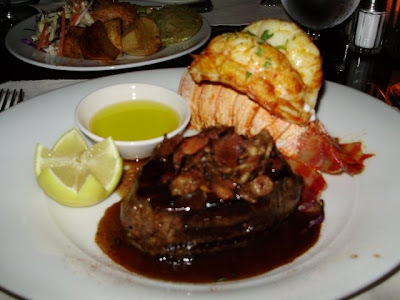 I had fillet of beef and shrimp and Mert had a fillet and lobster. They're quite fancy in how they serve lobster. The tail is cooked outside the shell and presented beautifully. Hard to eat mind you and the waiter, removes the shell so the delicate tail can be enjoyed without a hastle. We also received a plate of side dishes that were over the top. 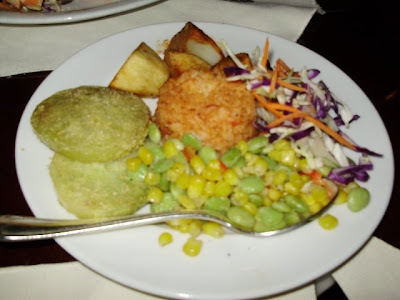 Fried green tomatoes, corn and lima beans. Did you know I like lima beans. I don't think I've ever had more than 2 at a time. I usually only get them when I have Campbell's Vegetable soup. If I'm lucky, I'll get 2 in a serving..... Here, I think I died and went to heaven. So after about an hour and a half of eating and sipping away at a bottle of wine, we were faced with the thought of desert. 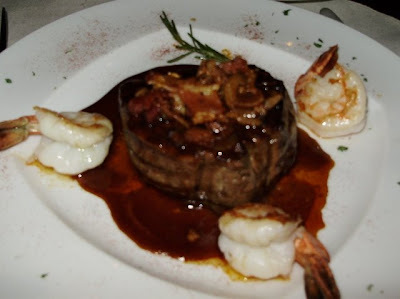 We knew we couldn't eat another bite, since we had left over half of our filet on the plate, but we ordered anyway. So we slowly ate our chocolate mouse.. a light chocolately, smooth end to a wonderful meal. I totally forgot to take a picture of the mouse, but you can imagine. We finished off our evening by going to the theatre and watching the performance "Dance" which we both throuroughly enjoyed. Happy 25th Anniversary to us! (sort of) We'll do this all again next March. A knock, knock on the cabin door.... Oh, it's 7:30, our morning coffee delivery.... - in the excitement I forgot about this coming. It's now about 8:30am when the ship is positioned at the mouth of the canal. Wow I can't believe we're going through. I think of when I was in Grade 4 or 5, learning about the canal and thinking some day I'll so see this marvel. Well, I'm here..... The canal is so familiar because I've watched this on PBS a few times, but it's so nice to be here and it's so green and lush and so .... real. I didn't realize that this is rain forest country. There are 2 seasons, a long rainy season and the dry season. The long rainy season is important for the replenishing of the fresh water in the lake and locks. No pumping here, it's all gravity fed and every time the entry locks open, they lose a lock full of fresh water to the ocean - on each of the Pacific end and the Caribbean end. We're inching along. If you didn't know it, you would think you were standing still. There is a sharp angle at the mouth of the canal and the tugboats help position the boat as they tie lines onto 8 locomotives that they call mules (2 at the front and back on each side) that will help keep the ship centered through the locks. There is only a few feet on either side. This is quite exciting. This third picture really shows how little space there is on each side of the ship. The locks have closed behind the ship and the canal is filling with water to go to the next level up. See the locomotives on each side. This shot shows the staggering of the ships as they come through the locks in the morning. I'm at the back of our ship taking this picture. I am so thrilled... To me, this is amazing. There is a narrator on the ship telling us many things about the Canal. The calculation of the fees that the ships pay, the schedules, the future plans of the canal, the history of the equipment, the loss of the fresh water... many many facts. We proceed through the 3 levels and then move into the lake where we sail through misty rain forest for the rest of the morning. Mert and I lay on teak chaise lounges for hours on Deck 7, just watching the rain forest, the birds, some canal excavators and other ships going in the other direction. 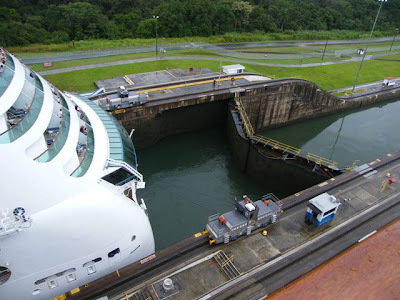 Then about 1pm there are 2 more sets of locks that step us down to the pacific ocean and brings us to the Port of Panama. About 6pm, we board the tender to take us into the dock where a bus is waiting to take us to the Mirafores Locks Operations center. It's now dark again and the info sheet says, there's no guarantee that we'll see a ship go through on our tour..... I think to myself, oh well, at least I saw us go through. We got to the locks, and it's a 24 hour operations. The night lights reinforces the very industrial nature and look of this operation. It's so interesting. Ha.... there are more boats lined up to go through than you can shake a stick at. It was a very interesting prospective to see the operations from dockside. What a great day... an early start and back on board the ship at 10pm. We're pooped! To late for a fancy 25th Anniversary supper, so we grab a quick something to eat from the ships buffet and we plan our special supper for the next night. I'll tell you about that tomorrow. Nov 22 - Early in the morning - about 7:30am. While watching the sun come up in the east, Mert and I are enjoying a pre-breakfast coffee on the deck of the Coral Princess. An announcement is made by the captain that we will be altering our route to assist in a medical emergency on a 33 ft sailboat. We'll be steaming for about 2 hours before reaching our target. This was an exciting event and we're thankful that everything turned out well. Here's a 3 minute video. We arrived back to Freddy Beach today and we're pooped. I have so many things to tell you about and I don't know where to start. First off, congratulations to Michelle and Scott, who received, by private ceremony, their X-ring today at St. Fx U. As I type this, they are out for a celebratory supper with Donna and Terry. I hope you will see some pictures on Donna's blog tomorrow!. Our trip to Panama was awesome. It was a great 2 week vacation. Cruising isn't as bad as I imagined it to be. I imagined, that I would have put on 15 pounds, and wouldn't fit into any of my clothes. We employed various strategies to deal with the excess of food, and by about day 4, we started to relax about it all. 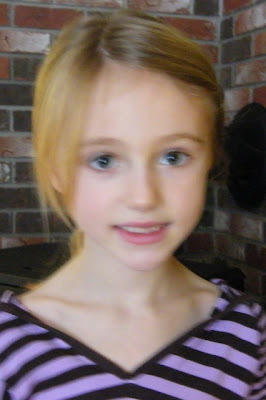 We had settled into a routine and felt more confident. I know you're saying to yourselves..."Oh, to have such problems". 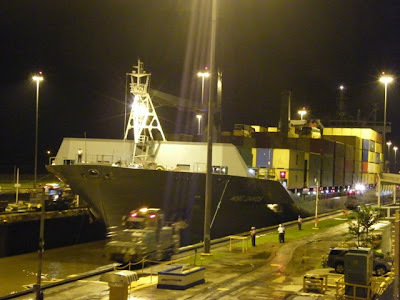 The Panama Canal was amazing, and I've always wanted to go there ever since learning about this modern day wonder. I guess I would have learned about that in grade school. About 10 years ago, Mert and I started, to discuss going for a visit and some time early on, we said, we'll go for our 25th. We should have gone for our 16th, or 17th, or 20th. We shouldn't have waited. The whole cruise was exciting. On the first day of our cruise, our trip was interrupted slightly because we had to do a medical rescue to a small sailing vessel that had 3 crew, one of which was critically injured. They were in the middle of nowhere.... That was exciting. I'll post video that I took of this tomorrow and share some more detail. 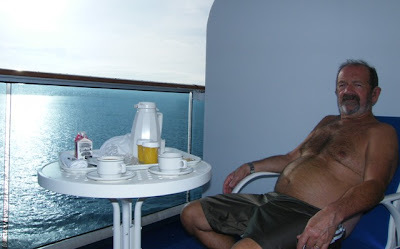 Our post-cruise rest in Acapulco was nice and relaxing. The city is dense, and has more VW bug taxi's that we could have ever imagined. We didn't venture out too much. We mostly laid in deck chairs and played in an edgeless pool to keep cool. We never did a bit of exercise for those 3 days because it was too hot. But we ate light meals :) so hopefully that helped. My poor sister lost her father-in-law late last week, and they went to Ottawa to be with family. This was all just before Michelle and Scott got their x-ring today. This is uncanny since when Dad died in May, it was just before Stephanie's Graduation. Well, we've drug out summer summer clothes, sandals, sparkly dinner wear, suntan lotion and we're leaving first thing tomorrow morning to catch our flight to Fort Lauderdale. 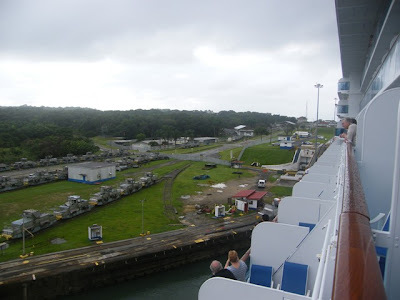 We'll board our Princess Coral ship on Wednesday after lunch and by suppertime, we'll be en route to the Panama Canal. We will have stops along the way and our disembarkation point will be Acapulco Mexico. Over the next 2 weeks, if you want to see where Mert and I are... Check out the bridge Camera every day. It'll give you our location with a view right out of the front of the ship. http://www.princess.com/bridgecams/co/coral_bridgecam.html This bridge cam updates every 2 minutes. Just press F5 to refresh. Of course the big highlight of this cruise will be passing through the Panama Canal all day and taking a tour of the inner canal and all the operations in the evening. That will be on November 23rd. We will arrive at 7am and sail through the canal and lakes all day. At 5pm, we tender to land to take our tours of the locks. That is also the day we celebrate our 25th Wedding anniversary. Of course our 25th anniversary is not really until March 23rd 2009, but no there were no cruises through the Panama that day.The last 3 days of our trip, we'll be in Acapulco, Mexico staying at the Emporio resort. Do not look at the virtual tours on the hotel website. Then we return to Bangor late on Dec 2. Home in our own beds Dec 3. Kenny loaned me his Ipod touch, so I'm going to check my yahoo email when I can. Let me know if anything special happens by my yahoo email! I'll respond to all emails so you know that I got your email. Yesterday, I attended Pfaff Club at our local sewing shop. We reviewed all the feet that come with our machine and optional feet. I brought my old Pfaff 1471 to work on for the afternoon and I was delighted to learn that I could move the needle over one or 2 positions. I thought it would only move to the far left or far right, or center. What fun. I also tested out the narrow edge foot. It works very slick and makes edge stitching very quick. 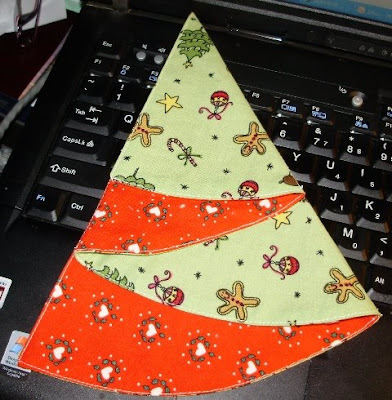 Have a look at this napkin that I sewed up in about 4 minutes flat, edge stitching and all. Needless to say, I have now added that foot to my collection. I just noticed on my blog dashboard that I started blogging 1 year ago today. I am approaching my 200 blog entries I'm going to do a little prize draw for my 200th blog. I think I mentioned that before. It will be around New Years. Keep an eye out..
Every year about mid November, Mert and I go to the Scoop and Save bulk food store to get our fruitcake supplies. Twenty five dollars later, we're home looking at our calendar, scheduling when is a good time to bake the cakes. We need a good half a day for chopping, preparation, cooking and cooling. These 2 cakes are ideal since they both need a 275 degree oven and take about 2 hours... so I cook them at the same time. So, today was the day. We started out early and both the dark and light cakes were in the oven by 10am. They've been cooling all afternoon, and we will wrap the cakes tightly in plastic wrap and then foil. We'll put them in the cold room until Christmas. When we bring them up, we'll divide them into smaller pieces, keep a good size piece out for us for the Christmas week and then put a fresh wrap on the rest of individual pieces and return them in the cold room for further curing. 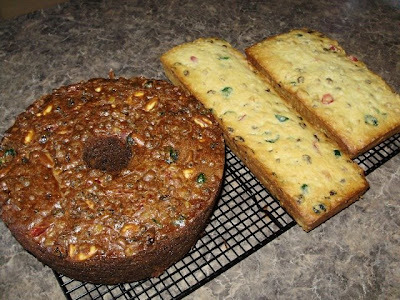 We never started out liking fruitcake, but about 15 years ago, I saw these 2 recipes in the local paper and something made me try them. We loved, loved both the light and the dark cakes and we've been making the same recipes ever since 1994. I still have the tattered newspaper clipping that I cut out using my pinking sheers. I used to cut a piece of cake and give it to the kids, my dad, and anybody who would take it. A funny thing is, that most people still do not like fruitcake. If they do, they like the light, and not the dark. In my mind, they don't know what they're missing...So I don't try to shove it on people any more. If anyone wants some, they know where to get it. Except Scott of course- my niece Michelle's fiance. He first tried my fruitcake a couple of years ago. 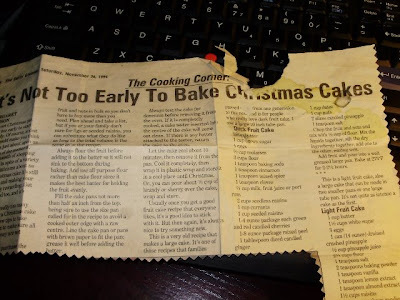 I think it was in the summer, so the fruitcake would have been at least 6 months old. It must have been a hunk that I gave to Dad at Christmas and it got lost in the back of my sister, Donna's fridge. Anyway, I recall that Scott got teased for eating 6 month old cake... That didn't stop him.... with in a day, that whole piece of cake was gone... So, the news is, he likes my dark fruitcake and he's out in the open about it. This guy has got taste! He's the only one on my list who is getting some this year! I know none of my immediate family will ask, but for my other blogger friends, if you want the recipe, just leave me a comment. I'll send to you or post it at the bottom of this blog entry later. Chop the fruit and nuts and mix with 1/2 cup of the flour. Mix the liquids together and add one to the other, mixing well. Add fruit and pour into a well greased pan. Bake at 275F for 2 - 2 1/2 hours. Chop the fruit and mix with 1/4 cup of the flour. Cram butter, sugar and add eggs one at a time blending well after each addition. Add dry ingredients to the butter mixture alternately with the liquids. Stir in flavorings and fruit. Bake at 275 F for about 2 hours. Less time if using 2 pans. Well, I started my crazy quilted sock in early August when my friend Lois developed a crazy quilted sock foundation pattern for us to use during Linda's class. I made up her crazy quilted foundation to test the design and it was good. So I made up another sock that was to be used when I did the class for real. No stitching on samples, just take the class and work on a real piece. Linda Hubbard worked her Crazy Quilting class to a 6 week weekly class and I think it was great. Each week we learned about stitches, trims, flosses, and beads. Step by Step I saw my sock turn into a real heirloom piece and I was loving it more and more every week. I wasn't sure what I was going to do with it, until the day I stitched an A on it. So it's for Aurora. She'll have it for her first Christmas and many more to come. I thought it would be done today, but it's not quite done, but done enough to reveal the whole sock. I surged off the excess fabric and it's ready to sew to the backing and lining... but I do need to add a more beads and stitching. I've spent time looking at other bloggers crazy quilting techniques, and now I see that there's not quite enough of either. I still have to do my spider and web. I've left this image rather large so you can click on it to look at some of the detail. Because it's not quite finished, you'll have to imagine that the finished will be about half an inch smaller all around. I am going to make 2 more foundations next month and take 2 these 2 socks to Myrtle Beach when we go this winter. I sometimes found the evenings long and so this will keep my hands busy. They will be for Jessica and Emily's 2009 Christmas. 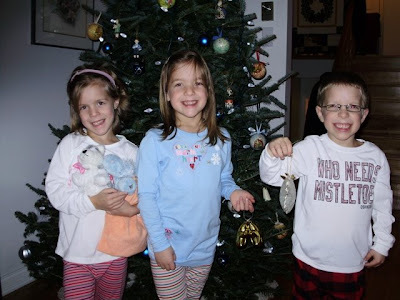 And then for 2010 Christmas, the triplets. The challenge will be to make them all a little different. What an exciting weekend we had. Carrie and Kenny and Jessica and Emily were here along with Patience and Aurora. Aurora loves Jessica and Emily and all the attention she was getting. They fed her her meals, changed her diaper and read her stories. I told Carrie, that having a baby now, would be a piece of cake because the kids are such a help. Kenny said, it's hard being a single parent tho!!!. That's his witty sense of humor saying, not on your life!!! 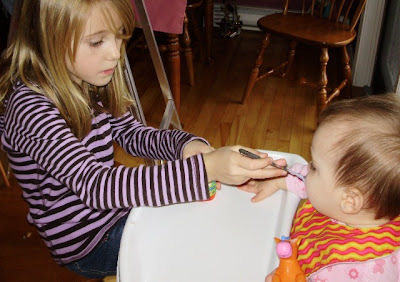 Here's Emily feeding Aurora. Kenny helped Mert put up our new kitchen light. I absolutely love it. It was harder to put up than they thought. 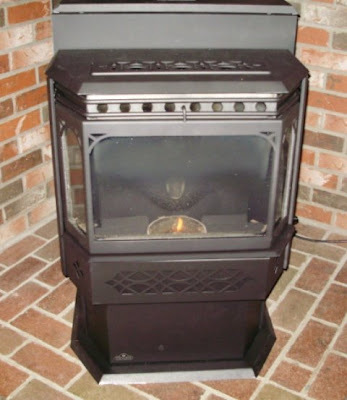 We also had our new pellet stove professionally installed. In 30 minutes, the stove people unwrapped, wheeled in on a dolly, installed the doors and all the movable parts and painted the pipe and we had a fire at about minute 27. It was so nice and warm. It's about the same size as our old one, but it has a bigger hopper and an electric igniter. 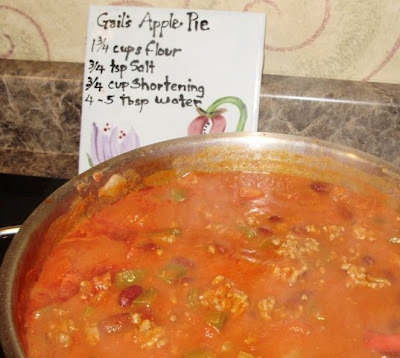 The other day I posted my family Chili recipe for Karen South's blog contest. She was making a draw from all the participants who posted their recipe. And you guessed it, I won! 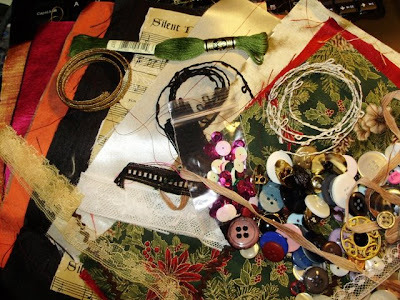 The package of buttons for Crazy Quilting is being sent to me soon. This is great timing since I'm almost finished my Crazy Quilted sock that I've been working on all fall, but I am piecing 2 more sock foundations in mid-December that will be crazy quilted over the evenings during cold months. Funny, I seem to get into little habits. 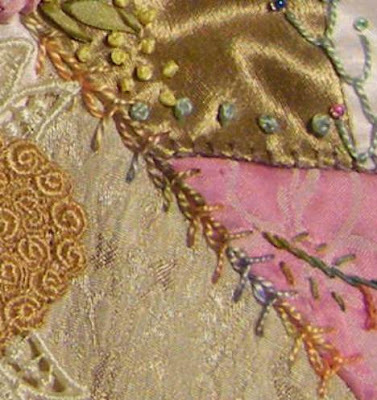 I sew by day, and crazy quilt or knit in the evenings. It's my new weight loss strategy. Keep those hands busy at night so the urge to pick at snacks is reduced. Thanks Karen for your fun and easy contest. I see that I should be hitting a 200 post milestone around New Year's. I think I'll make a contest to celebrate 200 posts. What will it be???? 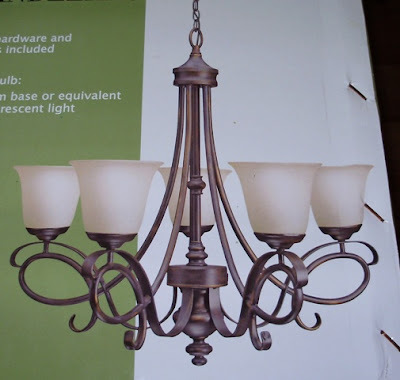 This post might seem like a repeat from this time last year, but yes, we're getting a new kitchen light. 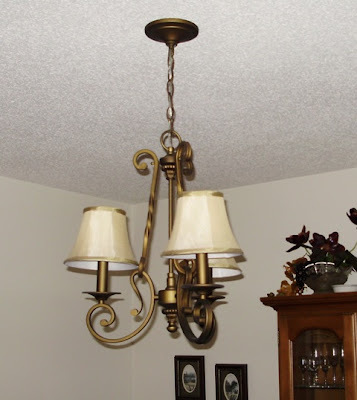 We did put a new kitchen light up last fall when we were doing our kitchen update, but ever since, I thought, the poor light looks kind of small. I didn't like to say anything. 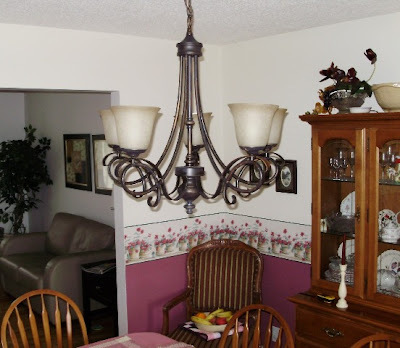 One one day last month, Mert and I were watching a make-over show on Oprah or other makeover show, and they said one of the common mistakes is not to purchase the right size light for your area. Mert looked at me and said, I've always thought our kitchen light is too small. I lit up and said "Me too!. So we waited for a sale on lights and voila we got a new light. Kenny and Carrie and the kids are coming up this weekend, so I'm so excited cause Kenny can help put it up. 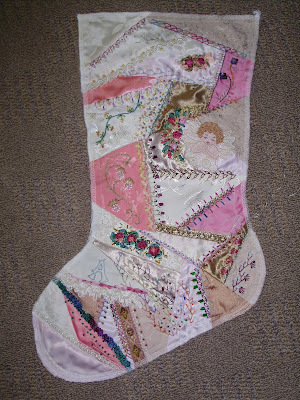 Since I've been doing my crazy quilted Christmas sock, I go to Karen South Crazy Quilt Blog and others for inspiration. I think looking at pictures of others work, is better than any book. Although I love the Judith Baker Montano Elegant Stitches book. Last night I learned the Wheat Ear Stitch out of that book and love it. I tried my new Sassa Lynn varigated threads too and love them equally if not more than the Stef Francis threads. The color changes are frequent, almost every other stitch. This color thread is called flower garden. I got them from Evening Star designs. Anyway Karen South has a bit of a Chili recipe challenge on her blog and is asking for our favorite chili recipes. One recipe there has chocolate in it, and another cinamon. If you read down a few days at Karen's chili recipe, it has spagetti in it. She thought everyone made it that way. I just make plain old chili con carne. It's easy and we like it. Here's my recipe. Lightly fry ground beef, onion and green pepper. Drain of fat. Then add the rest of the indgredients and simmer for 1 hour. When I was a kid, Mom served this over rice, but now I either eat it by itself or have it over a green salad with taco chips. This might make for a nice make-ahead meal for when the kids are here this weekend. Great idea Karen. I have set a deadline of next Tuesday night to have my crazy quilted piece finished. Finished means loop sewn on, backed, and lined... Ready for Santa to put little surprises in. 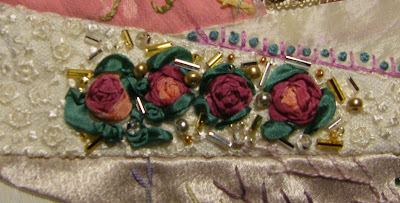 In looking a few crazy quilters websites this week, I notice that this seems to be a popular thing to do... do 4 roses all in a row. I love it too. I did some random beads around to give it a bit of whimsy. So, watch for a picture of the whole crazy quilted sock next Wednesday. Some good news, Carrie and Kenny and Jessica and Emily are coming for the weekend. Aurora will be here too, so it'll be fun with the kids around. Tomorrow I sew projects that are on my UFO list. 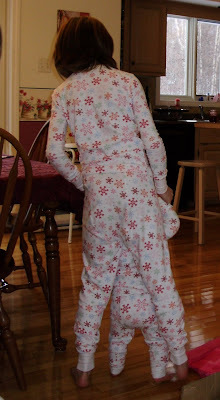 One of my favorite blogs, besides my sister's, is the Sew Mama Sew blog. You'll see it on my sidebar. On November 1, they started a daily blog entry that is themed, Handmade for the Holidays and they give you theme ideas each day for the entire month of November. They also give you pointers to tutorials for the item. Today, they had things for babies. I looked and it had a tutorial for making a tag blankie. I made one of these for Aurora in late August. She was about 6 months old. She loved it. I think I'll add this to my UFO challenge and make a couple for the Pink Table. Did I mention that they're having a craft fair at work on Nov 14th. Our Pink team have reserved a table as our first fundraiser thta will go towards our 2009 run. So I've made a list of things that I can make. Others on the team will be doing some baking and other things.